Sharon Cramer » FEATURED ARTIST! 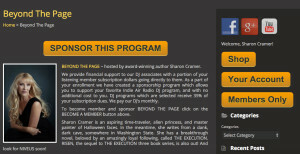 This week, I’m the featured artist on Indie Air Radio! That’s awesome because not only am I doing the weekly podcast, Beyond the Page, I’m slowly compiling the AUDIOBOOK. So many of you have asked for the audiobook of The Execution, so it’s on the way. Thanks, everyone, for listening!